Eeek!! HAPPY MONDAY & welcome back to my little BLOG! Did you join us at the AWESOME HOUSE-MOUSE & FRIENDS BIRTHDAY PARTY BLOG-HOP these past 2 weeks??? Sure hope you found the time because it was very special and soooo much FUN!!! We want to thank all who helped us celebrate, those who joined us and all of YOU FANS out there for the LOVE you've poured on us!! WOW!!! YOU are the ICING on the CAKE!!! You motivate our TEAM to keep doing what we do and we want to THANK YOU ALL from the bottom of our hearts for your incredible support! We were absolutely thrilled to see all your beautiful entries. You guys are full of amazing creativity! WOW!! Personally, it's going to be super tough for me to choose my 2 lucky winners for my 2 BIG YUMMY PRIZES..... I will need extra time to sort out all the details. The winners will be chosen using Random.org and these prizes will go to those who followed all BLOG-HOP rules. Some of the Design Team Members will announce their winners with their new challenge post today, but an official announcement with a complete LIST of WINNERS will also follow (with a new post), right HERE and on the main HM&F MC Blog on Wednesday, September 28th. So, please remember to come back to check if you've won! Now here is my Christmas Sparkly take using traditional colors. I stamped this sweet image 3 times, then colored, cut and layered it together for this dimensional look! 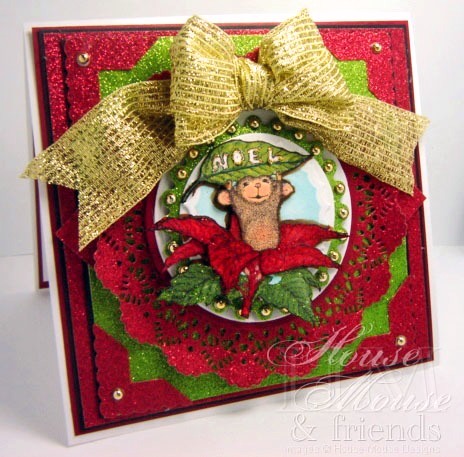 Come check out what my Teamies created for this Sparkly challenge at House-Mouse & Friends Monday Challenge Blog found HERE! It is really christmas) Love the cute mouse on this card! The red lacy paper looks fantastic here! So much glitter and sparkle! I love your card and the traditional colours too. Awesome card for the challenge,it is truly a work of art. I'm looking forward to making a card for the challenge. That giant gold bow is perfect, and that shimmery red doily is so lush! Your card really feels like Christmas, America! Fantastic. AWWE!! Your Christmas card is GORGEOUS!!! love it all! Gorgeous card America, the image is adorabkle and I love the sparkle. Thanks for joining us at Simon Says Stamp for our punches &/or dies challenge. Oh, this is wonderful!! LOVE the colors and the sweet stamp images. Hi America, this is stunning - your the sweet Housie and the beautifully decoupaged. Your colours and your decoupag are so glittering and scrumptious. you make lovely cards an such beautiful colors! I invited you friendly to me blogspot. Wow America you sure have pulled the Sparkly chall off with this awesome colourful creation love all the die shapes..& your stunning colouring ..
Gorgeous Christmas creation America, I love your image and design. So cute pictures i really like it actually i just tag my friends in that . thanks for it. Gorgeous card America - I love all the fabulous sparkle.